SKAFTAFELL, Iceland - The terrain in southern Iceland is as gritty as burned toast, pockmarked by glacial craters and sprinkled with boulders that can be as big as dump trucks. Keep driving, and you come upon fields of bumpy lava blanketed with moss. Hot air rises off the blackened plains like distant fumes. These flood plains, known as sandar, extend some 800 square miles. Parts of the southern coast were formed some 9,000 years ago, when meltwater spilled out from under Iceland's cloak of glacial ice and galloped forward in violent surges called jokulhlaups, or glacial outburst floods. But jokulhlaups (pronounced YOKE-uhl-howps) are no geologic remnant of the distant past. They occur with almost predictable regularity today, and they may pose great risks to life and property in Iceland. Glacial floods occur in many regions of the world where mountaintop glaciers sit on top of volcanic regions, as they do here. Fluids, gases and steam from active volcanoes continuously melt the overlying ice, creating pools of water sandwiched by glacial ice. Some of this water drains off at intervals, at times trickling out and other times leading to floods. 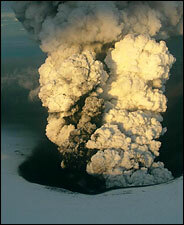 An Icelandic volcano that erupted in November 2004. But the most potent type of glacial flood is caused by an erupting volcano. Glacial ice cloaks 10 percent of Iceland, a country that straddles the mid-Atlantic ridge and is a simmering cauldron of geothermal and volcanic activity. Nearly 60 percent of volcanic eruptions in Iceland occur beneath glacial ice. That is what worries scientists. Katla, one of Iceland's most notorious volcanoes, has erupted five times since 1721, at intervals ranging from 34 to 78 years. The last one was in 1918, so an eruption may be overdue. "Basically everything you see to the east of Reykjavik is a wall of mountains formed in eruptions under glaciers," said Magnus Tumi Gudmundsson, a professor of geophysics at the University of Iceland, who added, "Katla has been showing signs of unrest over the last few years." To head off catastrophe, geologists and civil engineers here have developed an extensive, exquisitely sensitive monitoring system intended to provide early warnings of floods. It has issued 16 accurate forecasts since 2001, though it has yet to contend with a major eruption. When the birth pains of an eruption begin, pressurized magma oozes toward the surface of the volcano, leaving boiling groundwater in its path. Glacial ice acts as a lid on a giant pressure cooker: the thicker the ice, the more force with which it presses back against the erupting lava. When a volcano erupts, magma as hot as 2,200 degrees Fahrenheit meets ice and boiling water, sending vast plumes of steam and rock particles rocketing upward in what Matthew J. Roberts, a glaciologist with the Icelandic Meteorological Office, compares to a classic mushroom cloud. That is not all. Steam combines with tiny particles raining out of the eruption to create high static charges, causing lightning strikes several times a second. The 1918 eruption of Katla is said to have killed hundreds of heads of livestock grazing nearby - by electrocution. Then come the jokulhlaups. "An eruption beneath a thick glacier often leads to a hazardous glacial flood that can begin within minutes to several hours after the eruption has started," Dr. Roberts said. Floods after a volcanic eruption are a mixture of water, ash, mud and ice; they tend to leave the surrounding countryside covered in ash. Records from floods in the 1800's indicate that icebergs of Titanic proportions were seen drifting near farmhouses. And one flood is thought to have heaved ice blocks for miles. Geologists are still uncovering this ice, which was buried by so much insulating debris that it is still there more than 150 years later.